Hi there! I’m Kelly from Typically Simple where I share recipes, kids’ crafts, and easy DIY projects. 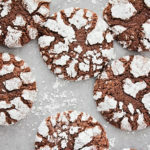 Simple dessert and treat recipes are some of my favorite things to make, especially during the Christmas season! 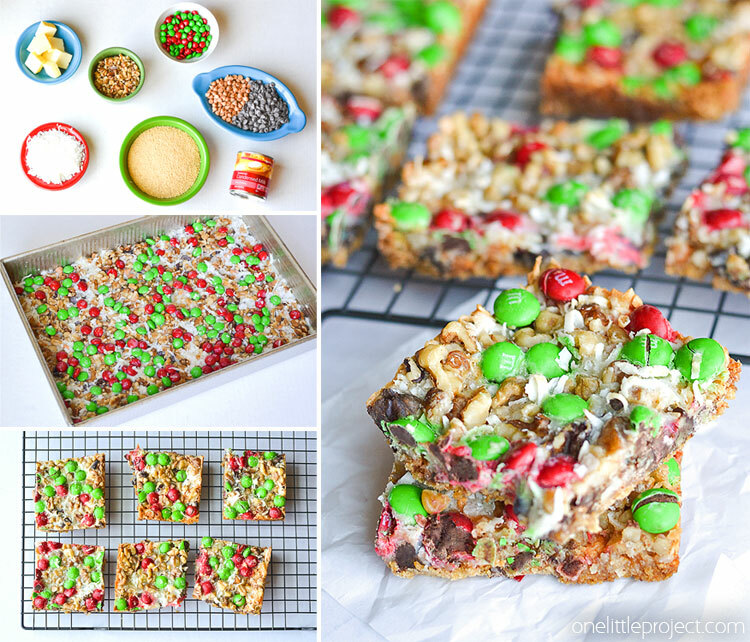 Growing up, my mom always made these delicious magic cookie bars during the holidays. Just by looking at them, I thought a lot of work went into making them. When I was old enough to start helping, I was pleasantly surprised by just how easy they really are to make. I have so many great memories of sitting at the kitchen island while my mom baked all different types of cookies and bars for Christmas. But my favorite ones to eat are definitely these magic cookie bars. With all of the different flavors melting together, they really are magic! Now that my little guy is old enough to “help” me with the baking, I’m always looking for simple recipes that the two of us can make together. After a few messy incidents involving flour, these magic cookie bars were a much welcomed, easy to clean-up recipe to try out with him. His favorite part of making any recipe is the mixing and while this recipe really doesn’t need any mixing, I usually give him a bowl full of chocolate chips and butterscotch chips to mix together. It helps to keep him busy while I work on making the graham cracker crust for the first layer. And honestly, the hardest part about these magic cookie bars is the waiting to eat them part! 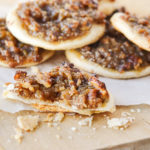 I love that you can add or change ingredients to your family’s favorites. My little guy is not a huge fan of the coconut (which he calls white lettuce) and it’s actually my favorite part, so in the future, I will be sure to leave off the coconut on a small section of the bars. 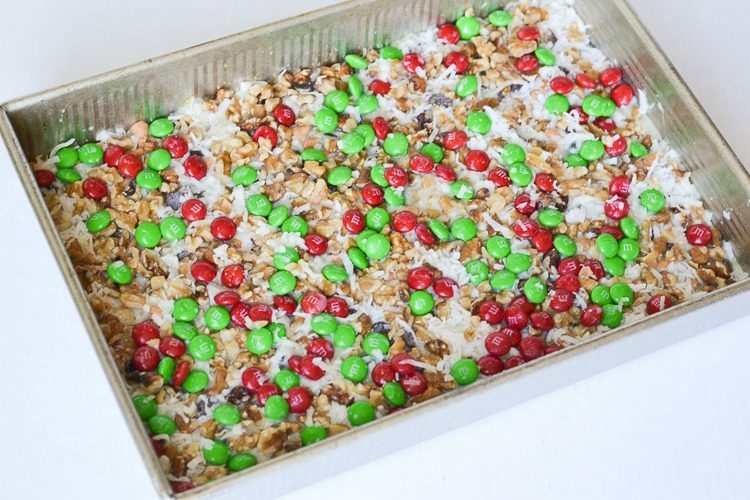 For this batch of magic cookie bars, I also made them a little more festive for the season by adding Christmas M&M’s to the top! 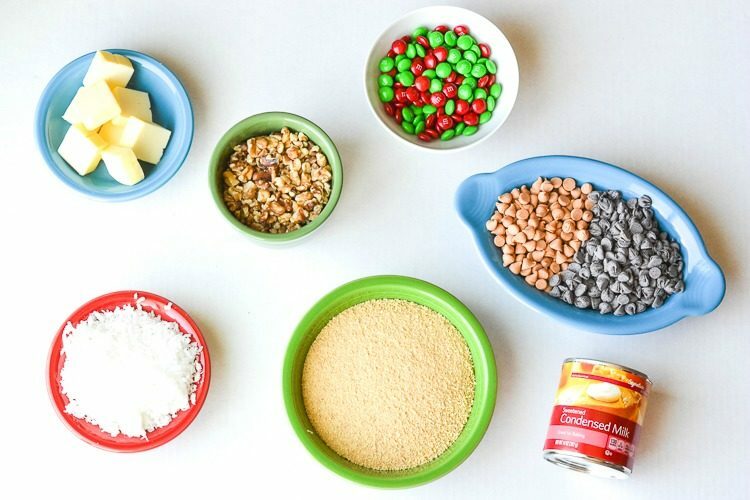 It’s a really great recipe to make with the kids; they will love layering all the ingredients and even adding some extras like sprinkles to the top! 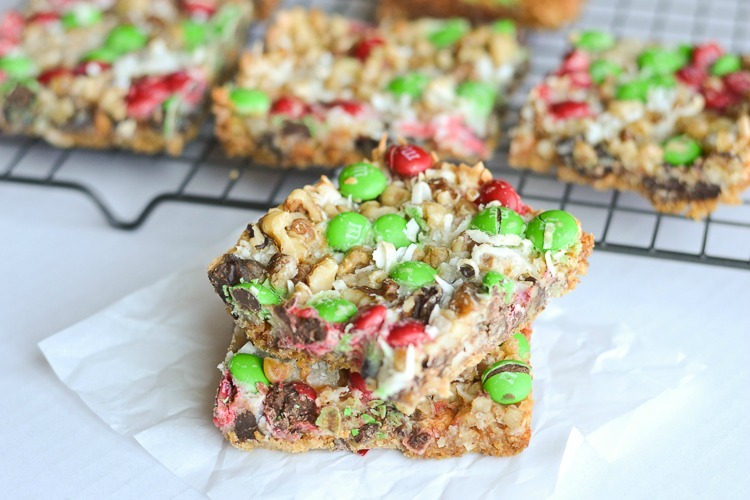 This magic cookie bar recipe is straight out of my mom’s recipe book, with the addition of red and green M&M’s. I usually make it with regular sweetened condensed milk, but I just happened to grab a can of caramel flavored condensed milk at the store, and I have to say, I might be using that more often for this recipe. It really adds a bit more rich flavor to these bars! Preheat the oven to 350°F. 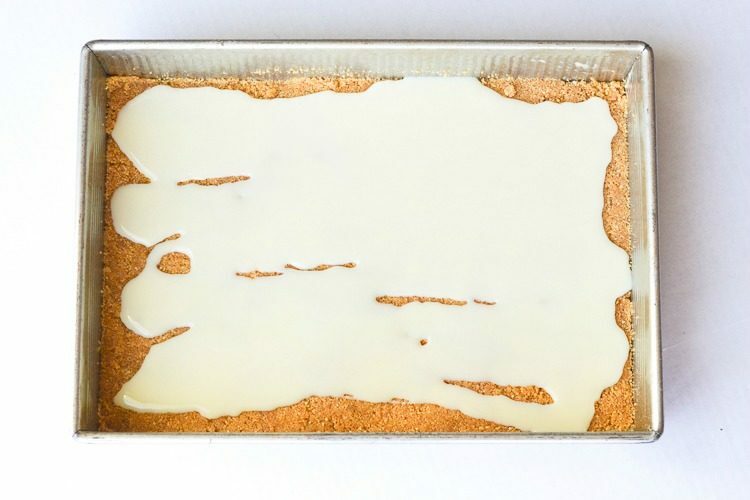 Grease a 9×13 pan with baking spray, making sure to spray the sides of the pan. Melt the butter in the microwave and combine with the graham cracker crumbs in a small bowl. Pour the mixture into the greased baking pan. Press the graham cracker mixture firmly into the bottom of the pan using a spoon or fork to create a crust. 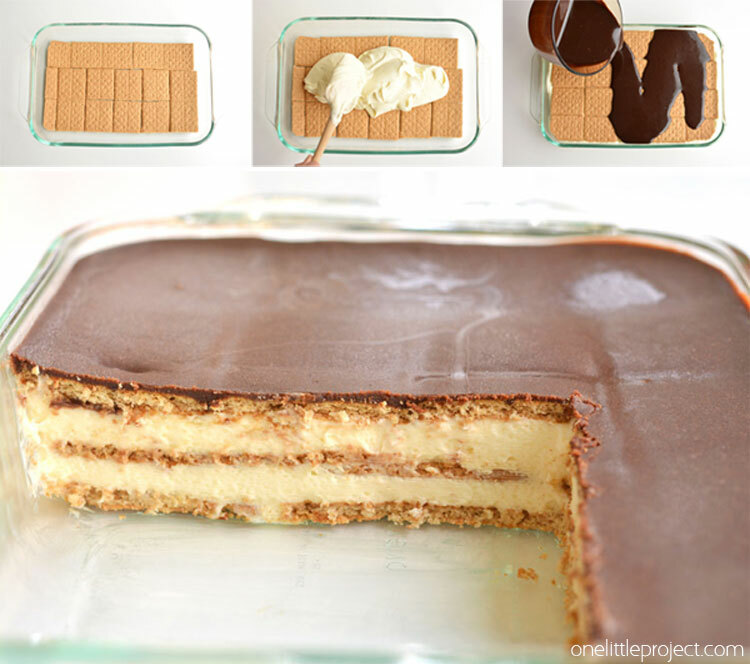 Pour the sweetened condensed milk evenly over the graham cracker mixture. If needed, use a spatula to spread it to the edges of the pan. Sprinkle the butterscotch and chocolate chips evenly over the mixture and press them down firmly. This part can get a little tedious using a fork or spoon, so I find it really helpful to use a spatula! Continue sprinkling and spreading each ingredient over the last and pressing each layer until you have used all the ingredients. Top off with sprinkles, if desired. Bake for 20-25 minutes. 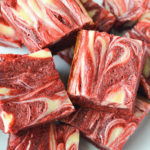 Allow to cool completely before cutting into bars. If you want to speed up the process so you can eat them sooner, pop the pan into the fridge for about 10-15 minutes. Enjoy! 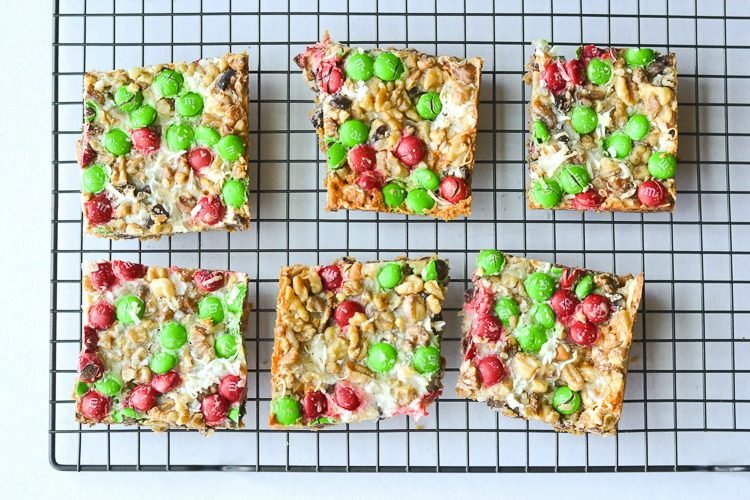 These Christmas magic cookie bars are a perfect treat to serve at a holiday party, just cut into bite size pieces and serve on a plate for a delicious after-dinner dessert! 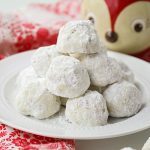 And include a few bowls filled with Christmas Muddy Buddies to create a festive treat table for your holiday party guests. If you’re looking for more easy holiday desserts, you HAVE to try our super easy, no bake chocolate eclair dessert! It’s soooooo good and really simple to make!! We don’t care for the butterscotch chips, so sometimes they’re omitted or we substitute dried cranberries or another kind of chip. I also like Marilyn’s idea of using dried cranberries, as a sub for the butterscotch chips! When I hit the print button above, what showed up on my printed sheet was MISSING the M&M’s ingredient. Very strange since it shows it there but the actual print off doesn’t have it. In my family, we call them “Hello Dolly”s. 🙂 And weird about the printing issue!? I noticed the M&M’s were missing so I edited the recipe yesterday morning to add them in. So maybe your computer was bringing up the old version somehow when it printed? Very weird! SO just going to blow your mind a little. NExt time you make magic bars put the sweetened condensed milk as the last layer on the top. It will result in a gooey amazing bar!! !